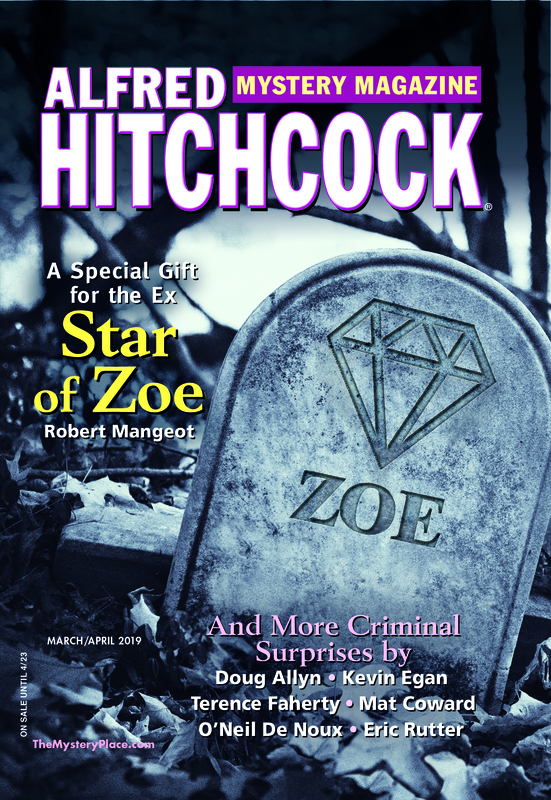 Robert Lopresti’s character Leopold Longshanks solves a mystery in AHMM for the ninth time in the May issue. Here, the author talks about his relationship with an ever-present aspect of literature from fair-play puzzles to thrillers to whodunits: clues. When people find out I write mysteries the most common question is: Where do you get your ideas? I have stories in my file cabinet with concepts I love, terrific conflict and action (or so I think). But they will probably never be finished, because I don’t (ha ha) have a clue. Not all stories need clues, of course. People who don’t read mysteries often think they are all like the ones Agatha Christie used to write: fair play tales in which a crime is committed and a detective figures out whodunit using only the evidence available to the reader. Those are the stories that need clues. But if you pick up any issue of Alfred Hitchcock’s, or any other mystery magazine or anthology you will probably find that less than half the stories fall into that category these days. Here’s another example: I just looked in Shanks On Crime, my collection of stories about Leopold Longshanks, a mystery writer who reluctantly plays amateur sleuth. Of the thirteen stories (most of which appeared in Hitchcock’s) only eight could be described as fair-play mysteries—and that is interpreting the term very liberally. I’m surprised the number is that high. There are some writers who seem to look at the world through clue-colored spectacles. Consider the late great Edward D. Hoch (who wrote almost a thousand short stories), or my friend John M. Floyd (a master of the quickie solve-it-yourself puzzle). I imagine that when they look at a breakfast table, they imagine how scrambled eggs could point out a murderer, or a glass of orange juice might reveal a blackmail scheme. I wish I could do that. But I can’t. So when a rare clue does pop into my head I jump to work building a story around it. Which brings me to “Shanks Goes Rogue,” the fourteenth story about my hero, which I am delighted to report is in the new May 2016 issue of Hitchcock’s. This story began when I was reminded of a fact I had heard a hundred times, but some reason on this occasion my brain said—that’s a clue! So I handed it to Shanks and voila. I had my 26th appearance in my favorite magazine. While tinkering with this essay it occurred to me that you don’t actually need a fair-play story to use a clue. For example, take my new comic crime novel Greenfellas. It’s not a whodunit at all, but a sort of pilgrim’s progress about a top mobster who decides it’s his responsibility to save the environment. No crime to solve there (hey, he’s committing most of the ones in the book) but there are traitors in his midst, and my hope is that he spots them before the reader does. And that requires clues. And clues are hard. Or did I say that already? I hope you enjoy the story. Rob, I always enjoy your stories. Keep ’em coming. I loved the latest Shanks. Congrats on 26 in AHMM!